Only Mark Master Masons are eligible to become Royal Ark Mariners (often referred to by its acronym, RAM). The Degree teaches the importance of family strength and the need for all members of society to play their part for the benefit of all. The Degree of Royal Ark Mariner (RAM), although worked under the aegis of the Grand Lodge of Mark Master Masons, has no real historical connection with the Mark Degree. In essence, the Royal Ark Mariner Degree stands alone and, is entirely unrelated to any other Masonic Degree. The Degree is both inspiring and beautiful. There is only one ceremony of “elevation”, and this is relatively short, usually taking less than an hour to undertake. The Head of Mark Master Masons for The Province of Wiltshire is Andrew Beaumont. He moved from Fulham in London to Bradford on Avon in 1993 and since 2009 has lived in Norton St. Philip. He is married to Diana and has a son and a daughter, together with a grandson and two granddaughters. Andrew was born in Nottingham, although his family moved to Raynes Park, which is near to Wimbledon in London, when he was about six months old. After attending Pelham High School in Wimbledon, he attended the Kingston Polytechnic where he studied Computer Science. His first employment in 1974 was with Express Foods Group, part of Grand Metropolitan Hotels, as a Systems Engineer. In 1993 he joined Wincanton Logistics in Trowbridge as a Project Manager after working for various companies, including Levi Strauss, in a number of different roles. In 1998 he joined Dallas Systems in Bracknell as a Project Manager developing and implementing Logistic and Financial solutions for companies such as Carrefour, Somerfield, Superdrug, Iceland, QVC, Highland Spring and Godrej. This entailed travel throughout the UK, Europe and India. He remained with this firm, now named Infor Systems, until his early retirement in April 2014. Andrew was Initiated into Freemasonry on the 8th November 1979 in the Arthur Williams Lodge No. 3052 meeting in London, and became Worshipful Master in 1989. Following this he held various offices in the Lodge serving as Secretary from 1994 to 2008 and then Treasurer, an office he still holds. He was appointed LGR in 2000, promoted to SLGR in 2005, and appointed PGStB in 2014. He also joined the Riverside Lodge No. 7247 in 1987 and was Master in 2004 and 2010. In Wiltshire he became a joining member of Broade Forde Lodge No. 8547 in 1994 and served as Worshipful Master in 2006, 2013 and 2014. In 2011 he was appointed PPrGReg. Andrew is currently a Visiting Officer in London and Wiltshire. As a Companion in the Holy Royal Arch Chapter he was Exalted into Ranelagh Chapter No 834 in London in 1986, he was MEZ in 1992, 1997 and 1998. He was Scribe E from 1999 to 2011 and since 2012 has served as Treasurer. He was appointed to LGCR in 1998 and promoted to SLGCR in 2007 and then to PGStB in 2010. Andrew served as a Visiting Officer from 2006 to 2011 and as a Senior Visiting Officer from 2011 until 2016 during which time he looked after thirteen Chapters. His membership in Wiltshire started in 1998 when he became a joining member of Chapter of Friendship and Unity No. 1271. He served as MEZ in 2009, ADC in 2011 and 2012 and as DC in 2013. In the Mark Master Mason’s Degree, he was Advanced into Old Kent Lodge MMM T.I. in 1981 and was Worshipful Master in 1995. He served as Secretary from 2003 to 2008 and has been Treasurer since 2009. He was appointed as PrAGDC in 1999, as PGSD in 2001, as PPrGJO in 2005, as PPrGJW in 2009 and as PPrGSW in 2010. He joined Lansdowne Lodge MMM in Wiltshire in 1995, was Worshipful Master in 1998 and Treasurer from 2000 until 2015. He was promoted to PrGSwdB in 1999, PrGJO in 2004, PrGSW in 2008 and then, in 2014, to Deputy Provincial Grand Master. He was appointed by the Grand Master, as Provincial Grand Master in 2016. As a Royal Ark Mariner Andrew was Elevated in 1988 into the Old Kent Lodge RAM (it has no number!) and was Worshipful Commander in 1994, 2002 and 2003. He served as Scribe from 2004 to 2008 and has served as Treasurer since 2009. He was appointed to PrRAMGR in 1997 and RAMGR in 2002. In the Worshipful Society of Freemasons, he was Indentured into the Abbey Assemblage in London and became a Founding Member of the Box Tunnel Assemblage meeting in Melksham. 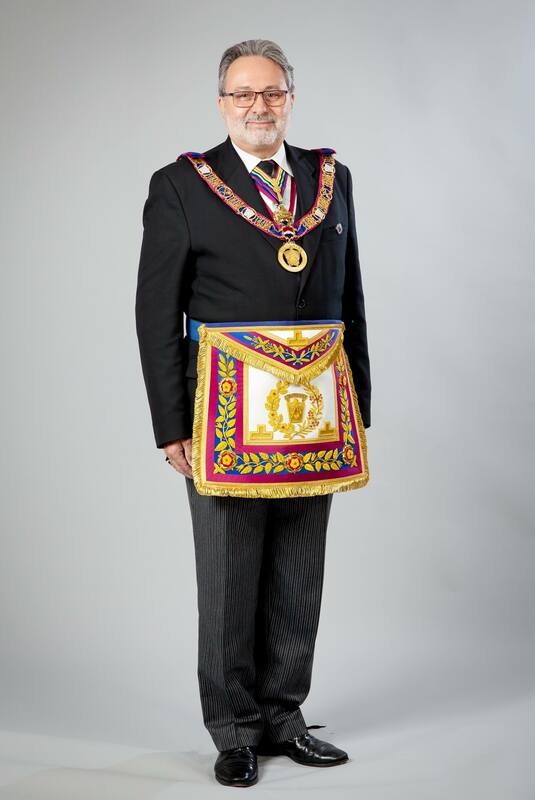 In the Western Counties and South Wales Region he has served as DMM Vº and is currently Deputy Grand Master Mason and Senior Past Master VIº. He was appointed a member of the VIIº in 2012. In addition to these degrees, Andrew holds Provincial rank in the Order of the Secret Monitor and Knights Templar and Grand Rank in the Order of Royal and Select Masters. Outside Freemasonry his interests include foreign travel, especially to India, reading and music. Located in the heart of London's West End, Mark Masons' Hall is the administrative centre for a number of Masonic Orders and home to Mark Master Masons. As a result of the very successful Mark Benevolent Fund Charity Walk in May 2017 which raised £437,934 the Trustees of the Mark Benevolent Fund wanted to give something back to the Brethren in the Provinces who had given so generously and decided to invite all the blood bike charities in England and Wales to apply for funding for a new vehicle. To date the MBF has sponsored 16 Blood Bikes and 10 Blood Cars. Friday 11th August was Blood Bikes Awareness Day and to coincide with this the MBF arranged for the national handover to take place at the National Motorcycle Museum in Birmingham to celebrate the important services, given completely free by volunteers, to all our communities. R.W.Bro. Andy Beaumont attended the Awareness Day to represent the Province of Wiltshire accompanied by W.Bro. Ian Dunbar and V.W.Bro. John Bell and his wife Mary. R.W.Bro. Ryan Williams, Grand Secretary, started the celebrations by welcoming everybody and outlining the day’s events. This was followed by a video presentation showing why we should all be very proud of what has been achieved so far. 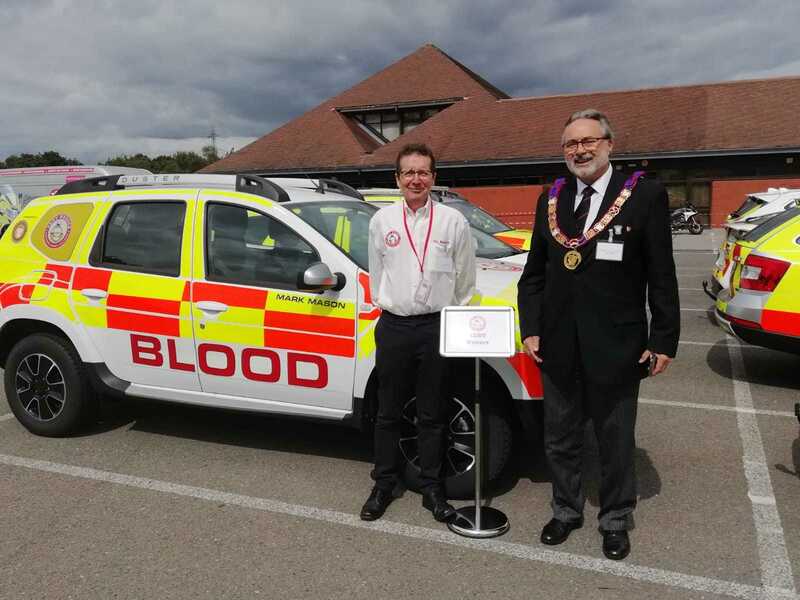 Mr Peter Robertson, Chairman, and Mr Graham Moor, Head of Marketing, then gave interesting talks illustrating the work undertaken by the National Association of Blood Bikes. Next came the dedication the Blood Bikes and Blood Cars which was very ably performed by V.W.Bro. Revd Bruce Harry, Grand Chaplain. R.W.Bro. Tony Morris, Deputy President of the MBF handed over the vehicles to each of the groups, including the SERV Wessex the group which covers Wiltshire, at the same time presenting them which commemorative plaques and certificates. The Blood Bikes Awareness Day was closed by R.W.Bro. Ryan Williams and everyone one then enjoyed an excellent buffet lunch during which we were able to admire all the Blood Bikes and Blood Cars that were on display and talk to the volunteers about the very worthwhile work that they do. When Rachel Le Flem posted a letter under the door of the Masonic Hall in Devizes on behalf of Holy Trinity Primary Academy in Great Cheverell, little did she think it would attract very much attention. However, leaving nothing to chance Rachel also contacted the Provincial Web Site to advance her cause. The Holy Trinity PFA is undertaking an ambitious project to raise funds for a rustic outdoor classroom in the grounds of the school, that will also be available for community use. The school believe that many children flourish in less formal and structured learning environments and several studies have proven the benefits of children spending time close to nature. 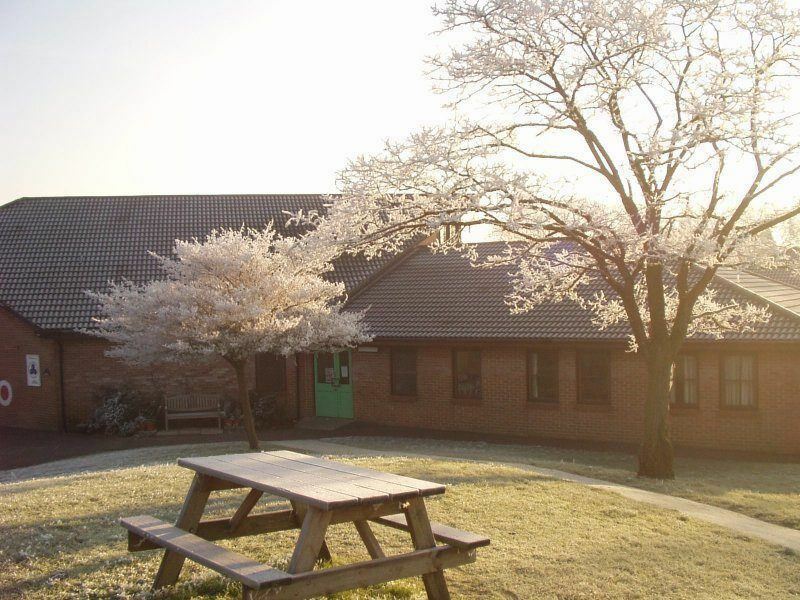 They need to raise over £8,500 for this classroom and are holding a series of fundraising events that will generate some of the funds necessary. Holy Trinity has also asked some local businesses and organisations if they would like to contribute towards the project and so it was that a very adventurous Rachel posted her letter. But why approach the Freemasons for help? Rachel takes up the story - "My grandfather was a Freemason and I know that he was involved in a lot of wonderful work for charity. I do however understand that, as an organisation, you must surely be approached on a regular basis. Both the PFA, and more importantly the children, would however be incredibly grateful for any donation whether large or small". It was this aspect of Rachel's story which gripped the imagination of the Wiltshire Keystone Lodge No. 178 and they responded to Rachel's request with what she describes as a 'very generous donation'. The school will be inviting the Bishop of Salisbury to officially open the outdoor classroom. They will also be inviting the Gazette Newspaper and all organisations who have been kind enough to contribute to the project. We will be acknowledging the support of contributors in any literature and will do our best to ensure that donations are recognised in publicity associated with the project. This should be a high profile project due to it’s ambitious nature and the longevity of the structure we intend to provide for the school. Martin Brown PrGM said "It is a real delight to be able to support a local school and I congratulate the members of the Lodge for their generosity"
To many Craft Masons, who do not know much about the Order, Advancement as a Mark Master Masons can seem as a quaint even humorous Ceremony. Some would dismiss it as being of very little ritual significance - they could not be more wrong. Those who are ‘Advanced’ as Mark Master Masons, and who take the slightest interest in the Order, soon realise that it is most certainly not superficial or trivial and the symbolism is worthy of deep study. Philip Bullock, Provincial Grand Master for Wiltshire, proposed by Bro Francis Wakem and seconded by Bro Peter Winton has been welcomed into the Order of Mark Master Mason by W Bro Stephen Bridge, Master of the Lansdowne Lodge of Mark Master Masons No. 1035. 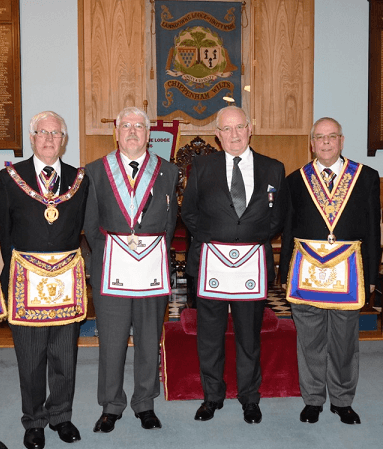 RW Bro Martin Brown, Provincial Grand Master MMM was joined by the Deputy Provincial Grand Master MMM, Andrew Beaumont as Philip made his Advancement and became a member of the Lansdowne Lodge of Mark Master Masons No. 1035 . Francis Wakem proposed the toast to the 'Advancee' as both a newly made Member of the Order and of the Lansdowne Lodge of Mark Master Masons No. 1035 in particular. Francis offered Philip every assistance and encouragement for his progress through the Offices of the Lodge , but issued him with a health warning , "you have other Masonic responsibilities". 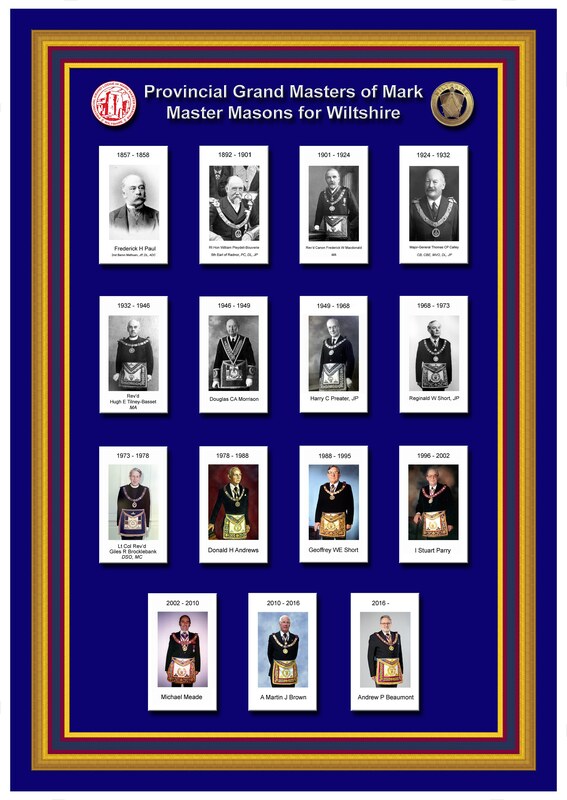 In his comments prior to the Toast, Bro Francis spoke of how the Degree of Mark Master Mason is one of hope and encouragement, pointing out that the ritual is built on a single verse – verse 22 from Psalm 118 “The stone which the builders refused is become the head stone of the corner”. we all have a part to play in the Building of Life. Of course it is possible to put one's own interpretation on the message which the Order proclaims, however there is clear encouragement that no man is beyond redemption, and the possibility of distinction is always within our power. Whatever one’s religion there is a powerful and enduring message of hope. A Christian can look to the words of St Peter in the Acts of the Apostles, Chapter Four Verse 11 when St Peter states of Jesus Christ, “He is the stone which was set at naught of you builders, which is become the Head of the Corner”. The Degree of Mark Master Mason represents the everyday life of each one of us; for the stone hewn from virgin rock depicts us all on our journey through life. Its final recognition as perfection should be the guide to our conduct through life that “we may be found worthy”.